Mr Tony Keneally, Wildlife Biologist, this morning visited the Boys National School in Millstreet. 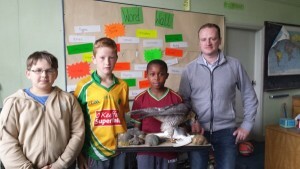 Tony gave talks to all classes in the school today about Millstreet and Ireland and the surrounding wildlife. He even brought some visual aids, as seen in the photograph on the right. I was informed that there were also tadpoles and newts which I am sure the boys enjoyed seeing up close. There are many habitats in our area. The River, Clara Mountain, there are also ponds up at Alps. We would sincerely like to thank Tony Keneally for taking the time to visit the Boys School today.